This is simply stunning. I love the string treatment. oh, how pretty. i love it! i love how the flowers pop...beautiful! This is gorgeous Maile! I love how soothing the colors are. The floss looks great through the punched holes! So soft and pretty! I love how you attached the sentiment! pretty Maile, love the flowers! Darling Maile, you continue to amaze me! This card looks so intricate and yet you make it sound so easy. Love your use of the colours. Just the right amount of every colour and the floss looks wonderful like that. Great touch with the liquid pearl. 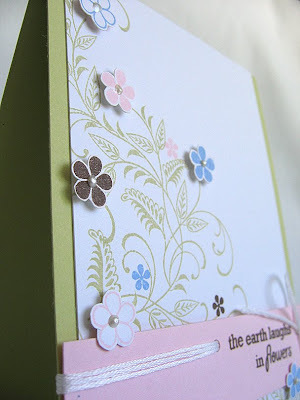 There is a beautiful simplicity to the cards you make - although they never look simple! That is one of my favorite sets, I love that vine!!! 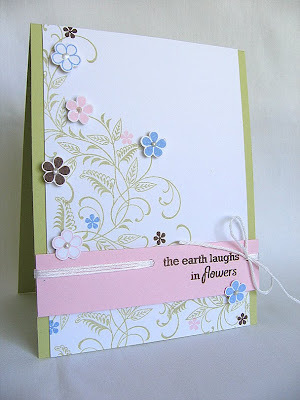 Great card, the colors are lovely and the embroidery floss accent is perfect!